While on vacation I like to send daily photo updates to my friends and family using a web album service. Web albums are a great way to include everyone on the trip as it's happening - and the best thing about it is that it's free! If sending photo updates while on vacation seems like a lot of work, it doesn't have to be - not if you do it in batches anyway. At the end of every day, I simply load the pics from my digital cam onto my laptop, add some captions and upload them to my web album (I prefer Picasa as it is linked to my Google account, though Flickr is another favorite). It's a great way to capture the day while everything is still fresh in my mind. Web albums also save your friends and family the potential agony of looking at hundreds, if not thousands, of photos once you return. By the time you get back, everyone will already know where you went, what you did, and who you met! 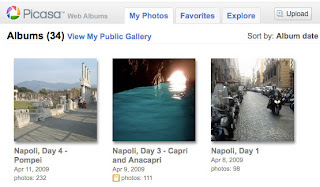 Joe Says: In a time when not everyone can afford to travel, web albums are the next best thing to actually being on vacation. Not saying that I can afford to - I'd just rather run up credit cards than lose my sanity.